"On the border between the most demanding dress code and the casual looks"
The Dublin is the classic english boot for all the seasons of the year. Perfect for a stylish look for the business man, no matter the time of the year, this ankle boot for man is color mocca, handmade in Spain, with authentic Goodyear Welted rubber sole, combines perfectly with semi casual looks and dress outfits. This is all thanks to the Oxford construction and the brogue that adorns the surface. This model moves along the border of the most exigent dress code and casual outfits. With suit pants, The Dublin reminds of a classic Oxford shoe, which can give the use same as the classic shoes. However, with slim fit pants, slightly rolled up to reveal the shaft of the boot, you will get a more casual look. This is a balmoral boot made following an artisanal process following a Goodyear Welted construction. This system gives the boot the comfort, flexibility and durability, with a superior guarantee of quality while isolating their feet from the cold and heat. 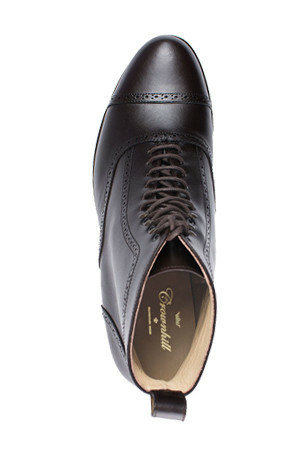 Cut with premium box calf and mounted on our last Wellesley, so we get a shoe slightly wider and sharper cutting edge. The inside of the boot is lined in calf leather vegetable tanned. Moreover, with our patented FlexiComfort we guarantee convenience and adaptability. Buen servicio tanto en la compra como en la entrega y modelo The dublin calidad en piel y acabados,muy satisfecho con la compra.